Dwell celebrated St. Anne, the mother of Mary, and grandmother of Jesus and the themes of space, place, and neighbourhood. 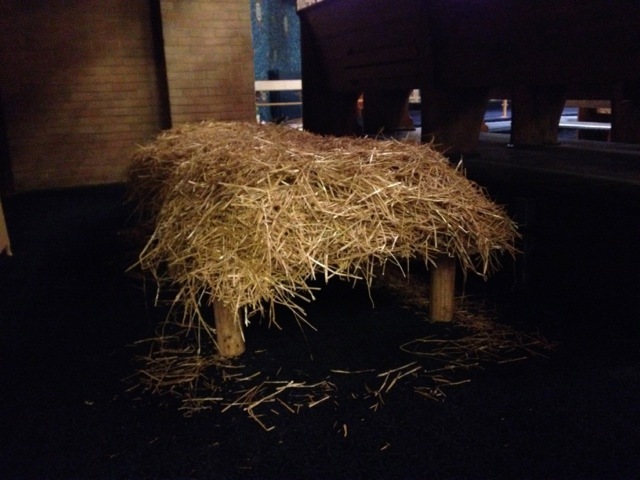 Inhere presents a bed constructed from found pallets and stacked with straw. Set adjacent, and in contrast to, the splendour of the altar at St. Anne’s Church, Inhere modestly recalls the story of Mary seeking a shelter in which to give birth to Jesus. The bed is a reminder that the church offers refuge for the body as well as the soul. Lily, multiple prints made with stamped white ink on white vellum, are offered to viewers to take. The lily paintings on the pillars in the church were used as a reference to draw a lily and produce a commercial rubber stamp. White on white echoes the lily as a symbol of purity. lily white ink on translucent velum prints, are offered to viewers to take. The lily paintings on the pillars in the church were used as a reference to draw a lily and produce a commercial rubber stamp. The lily is known as a symbol of purity and the context of the lily paintings in St. Anne’s suggest Anne as a symbol of purity.